If you are starting a business, then you should have a plan, a roadmap that takes you to your goals where you want to go. 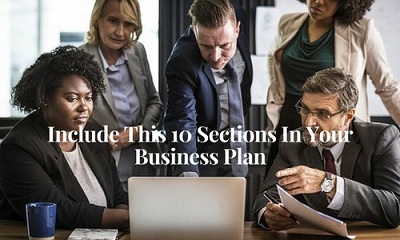 So, includes these top 10 sections in your business plan and this will help you, give ideas and cover your business from all angles and eventualities. This is a brief outline of what the entire business plan includes key points from all sections of the business plan. It presents an overview of your business as many investors make judgments about your business based on it alone. Essentially this document should be able to be separated from the rest of the plan and read individually and still make sense. A section of the business plan that provides a description of the business. The business overview section of a business plan should include information about the legal structure of a business, how the business came to be formed, the type of business, location of your business, types of business conducted, online sales, storefront, mail order, etc. and what products and services you will provide to your customers and clients. This part of the business plan should include how the business will operate, including how it will be set up, and who will be in charge of what responsibilities. Then add in your management team and personnel people reading your plan need to believe and have trust in the management of your business, so outline your credentials and the people you plan to recruit. Organizational structure, details about the ownership of the company, who is part of the management team and who are the board members. In addition to who the board members are you will need to describe why they were chosen to be a part of the board. It will be important to discuss the ownership information of your business. Is your business an incorporated company, a partnership, or a proprietorship? Such as names of owners, the percentage of ownership, the extent of involvement of each owner within the company forms of ownership and common stock information. This section is vital in showcasing the owner's knowledge about the industry within they have chosen to open a business in. For example, an industry description, industry outlook, target market, marketing testing data and marketing leads. Using a business plan to outline what products will be produced or sold or what services are offered is a wonderful way to communicate information to others. This section should highlight biggest seller’s unique products or services that your business provides and give a description of your items. Outline why you think people will buy, what you want to sell and detail on how you plan to sell to them. Once the products have been outlined in the business plan, it is important to discuss how these products will be marketed to the desired audience. What forms of communication do you plan to use to market to customers? Print, radio, internet or viral campaigns all forms of advertising should be discussed in depth. This section is important for potential investors to read, as it discusses the strengths and weaknesses of your competitors. Competitors may be both direct and indirect, and you need to show your potential investors how you plan to stay relevant in a competitive field. Your financial plan should include all your financial information of your company, including startup costs, balance sheets and other visual information to show the financial status of your company. Your business plan will change as your business grows and it will keep you focused. So, you will know where you are and where you are supposed to be. So that you can correct your course as needed. If it takes too long to write, it will take longer to read as well. Get rid of the fluff, cut the waffle and just get to the point. Be honest and note all the challenges that you face in your business. Being creative where your business stands out and grabs attention.